London Fanfare Trumpets are a civilian trumpet fanfare team based in the South of England that travel to functions the world over. A team of Herald Trumpeters is the most impressive way of drawing your guests’ attention to your function’s key moments. 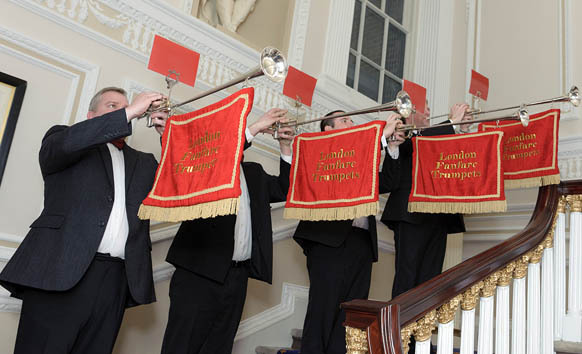 Whether it be a banquet, award ceremony, wedding or graduation, London Fanfare Trumpets are ideal for almost any event imaginable. There are times when an event requires something different – prestige, class, style, heritage and sophistication. These are just a few of the attributes that the capital’s Fanfare Team bring with them, as standard, to any occasion. 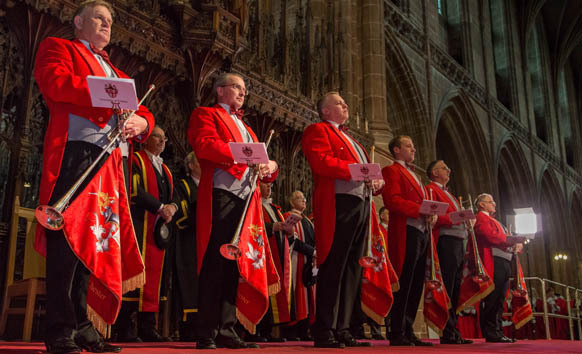 Our trumpeters have experience playing in some of the finest venues up and down the country, to audiences of all sizes. Prices vary according to length of time required, uniform worn and ensemble size. With so many variations available, we are confident that we can deliver you something within your budget. Watch London Fanfare Trumpets performing with Michael McIntyre at the Royal Variety Performance 2014! Please take the time to browse our website and see how we can turn a great event into a lifelong memory. If you have any questions which remain unanswered by the end of your visit or simply want to make a booking then please don’t hesitate to contact us. Our roster consists of players from all walks of life from long serving Army musicians to West end performers to Music Conservatoire graduates who have been trained by the finest musicians in the world. Fanfare trumpeters are traditionally associated with British pageantry, the military and the Monarchy. ♦ The wedding of Princess Elizabeth (later Queen Elizabeth II of England) and Prince Phillip in November 1947. ♦ The 85th birthday of Queen Elizabeth II in April 2011. ♦ The ‘Royal Wedding’ of Prince William & Miss Catherine Middleton in April 2011. Today, trumpet fanfares are a lot more accessible, but still achieve what they were designed to do – make a huge impact in a short space of time. We often receive comments from guests visiting from abroad, complimenting us on our appearance as they have admiration for such British traditions. As the City’s fanfare trumpets, we provide British culture, traditions and values, emblematic of the country as a whole. London Fanfare Trumpets offer a service that is truly unforgettable, so we will ensure there are lots of photo opportunities! Understanding the function of a trumpet fanfare will guarantee that its use is most effective. Fanfares have various different uses, therefore differ in duration, with anything from 5 seconds to around one minute in length. ♦ To announce the arrival of guests to a venue. ♦ To declare that dinner is served, and for the guests to proceed to the Dining Hall. ♦ As the VIPs or ‘Top Table’ proceed into the Banqueting Hall. ♦ To initiate the speeches. ♦ For the presentation of an award. ♦ To introduce a speaker. ♦ To introduce a VIP. ♦ As the red ribbon is cut. ♦ The unveiling of a statue or plaque. ♦ The Procession of the Bride into the venue. ♦ The Recessional of the Bride and Bridegroom from the venue. ♦ Entrance of the Newlyweds to their reception. ♦ The cutting of the Wedding Cake. ♦ The start of any sports event. ♦ Presentation of awards and trophies. ♦ The unveiling of a new product. ♦ To start the ceremony. ♦ The entrance of the Procession Party. ♦ The procession of the Graduands. ♦ Presentation of special awards. ♦ Any event with a Red Carpet should be accompanied by a fanfare team, to announce the VIPs’ arrival! We are more than happy to take your suggestions and can advise you on how to use fanfares to their greatest effect. It is a good idea to use Trumpet Fanfares sparingly as the more they are used the less impact they tend to have as the ceremony goes on. At London Fanfare Trumpets we pride ourselves on appearance, with particular emphasis on British Heritage. Please see our current selection of uniforms below; we have something suitable for every event. This is our most striking uniform, standing out from a distance with dazzling scarlet red tunics and 18-inch bearskin headdresses. 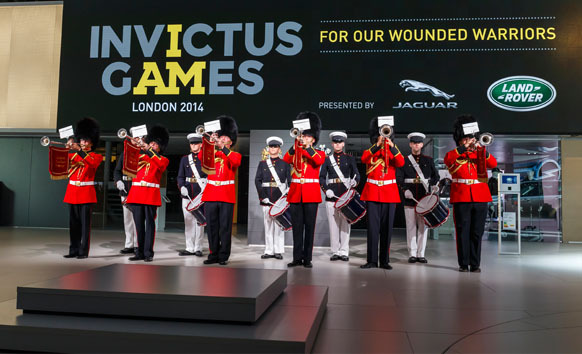 Ideal for events celebrating Britain, or for hosts entertaining guests from overseas. The uniform is similar to that worn by the Queen’s Guard at Buckingham Palace. We are the only civilian fanfare team with the ability to offer this look. Make an impression by treating your guests to something iconically British! Available in teams of all sizes (1-9). These red tailcoats are normally worn by Toastmasters across the country. It was in London that the red tailcoat was first worn by the famous Toastmaster, William Knightsmith in 1894, to stop him from being mistaken for a waiter. His coat was commended by King Edward VII and has since become a symbol of significance in UK venues. A scarlet coat is said to distinguish one from hundreds of guests and mark him as a man who has a unique part to play in the ceremonials. Available in teams of 1-4. The same costumes that were worn on stage with Michael McIntyre at the Royal Variety Performance 2014. Perfect for events at historical buildings or themed parties. Available in teams of all sizes (1-9). We are also able to wear standard Black dinner Jackets with an option of black, red or even white bowties with either white or black shirts. We aim to expand our uniform collection, so if we are currently unable to offer you something that you would like, then please contact us with your suggestions as we may be able to help.